Rancho Cordova is the perfect place for families who want short work commutes, and live close to a wide variety of recreational activities. Home to over 72,203 residents, Rancho Cordovians enjoy being in one of the most accessible parts of Sacramento. In addition to access to highway 50 from Sunrise Blvd & Hazel Blvd, Rancho Cordova has 5 local light rail stations that carry around 47,000 passengers per week. The driving commute to downtown Sacramento is 14 miles, or 19 minutes of travel time by car. 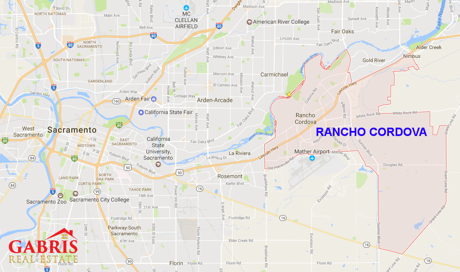 Rancho Cordova is one of the major job centers in the Sacramento area, with over 45,000 workers that are employed by over 3,000 businesses, including Fortune 500 companies like Health Net, Vision Service Plan, Delta, Dental, Verizon, and Aerojet. But, don't think that Rancho Cordova is all work and no play! This award winning city has has over 10 miles of stunningly beautiful American River Parkway access where visitors can raft, fish, kayak, swim, bike, and jog. Watch the sun set over the American River from one of many view points along the trail, and you will be convinced that Rancho Cordova is one of the best places to live in Sacramento. Major neighborhoods in Rancho Cordova include Gold River, Sun River, Anatolia, Stonecreek, Capital Village, and Sunridge Park.